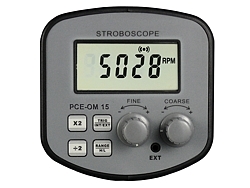 The PCE-OM 15 is a competitively priced Stroboscope which comes complete with the useful option of an external trigger function as standard. The PCE-OM 15 Stroboscope maximises the use of a 6500K xenon bulb and also has a multiplier switching function to provide a x2 y x½. detailed read out. 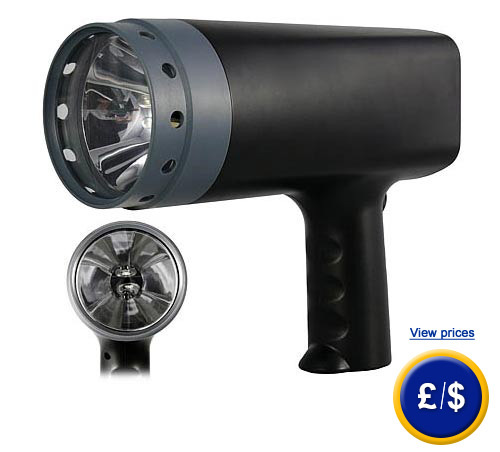 The PCE-OM 15 Stroboscope lights enable you to illuminate moving objects for a brief moment only, with a flash. Normally if there is a fast sequence of flashes, then the human eye will process light moments as a continuous image. The PCE-OM 15 Stroboscope however utilises the light it produces in a similar manner to filming techniques using the fast succession of individual images to confirm a continuous movement. The PCE-OM 15 Stroboscope therefore allows you to detect the rotation and speed of objects which cannot be seen by the human eye, enabling you to monitor and measure them optically. The PCE-OM 15 Stroboscope is controlled by a microprocessor, and powered by a conventional 230V supply. It is ideal for checking the revolutions of equipment such as transmission systems or motors as well as for general maintenance and planned preventative inspections subsequently saving you both time and money by eliminating the need to dismantle equipment to identify potential problems. Range 50 ... 30,000 r.p.m. Resolution 0.1up to 999 r.p.m. 1 up to 30,000 r.p.m. Operating temperature 0 ... +40 °C / <80 % r.H.